Life has been a little more dramatic than usual lately and I am not cooking nearly as much as I’d like. Last night I made a loaf of banana bread just to feel alive (in the kitchen, that is), but as I’ve already recently written about banana bread it’d be pretty boring to write about it again so soon (although this time I used caramel extract and added glazed almonds). Instead I’m going to go with the easy thrown together mess tonight offers. So start out that thinly sliced onion and garlic heating in ghee/oil in a pan warming to ML. Mix in the turmeric to color everything orange, let cook for 5m or so. 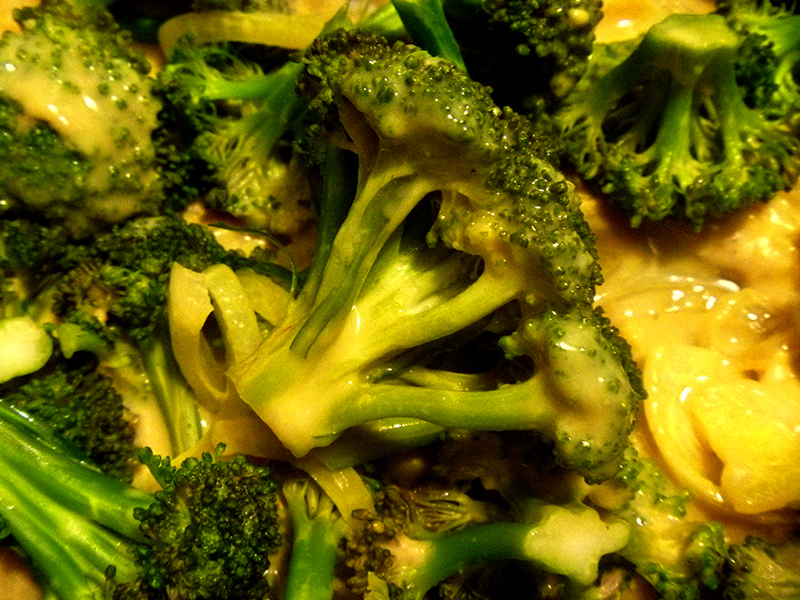 Turn the burner up to M, throw in the broccoli until bright green. Reduce heat and add in (already mixed with one another) the almond milk, gravy packet and spice mix. Mix everything then cover and continue to cook on ML for 10-50m, or until broccoli reaches your desired level of crunch. Serve over quinoa cooked with two drops of sesame oil in the water, then pull 4 spoons out of the silverware drawer. 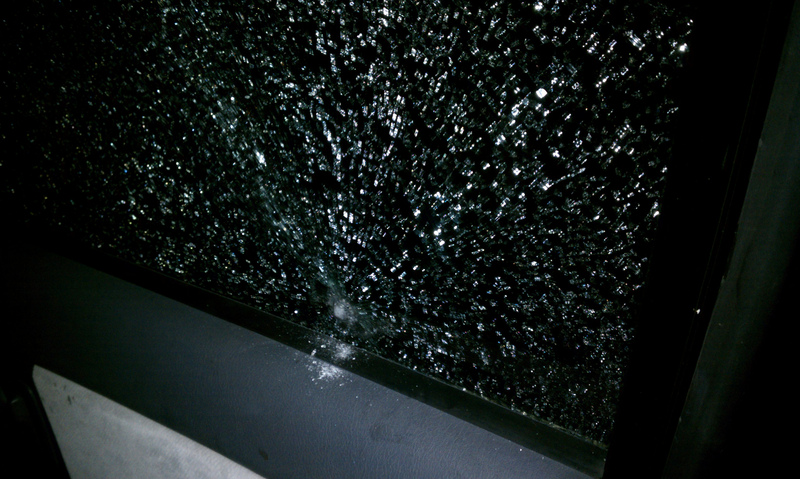 In terms of proof of my recent drama, how about this: my car window was shot out while the wife and I were driving through a neighborhood that didn’t look bad enough for it. This had certainly never happened to me before but now I can… check it off my bucket list? Now I can praise Jesus, Buddha, Allah and Xenu that the window stopped it before it came through at full force; I narrowly avoided this shot whose perpetrator probably won’t be found. And on Friday I start a new DMD (“Disease Modifying Drug”) that requires my first dose be monitored for six hours in a doctor’s office because it might dangerously slow my heart rate. If I clear that hurdle, however, I get to take a pill for MS instead of having to give myself nasty injections. I’ve been trying to clear off the bulk of my client(s) work in case of a worst-case scenario here, but it occurred to me that I also need to cook in case I am unable to feed us properly once getting home. If I weren’t so busy right now I might have time to be a little more scared than I am; as it is, I’ve got to stop spending selfish time here and get back into Photoshop. Wish me all kinds of luck getting to the weekend! This one’s easy, especially with a food processor. I can’t justify constant sweets but what else can I do with all the healthy, color-rich berries in my fridge before they spoil? Specifically, these berries still had a few more days before skin-wrinkling, so the clock was ticking on doing anything that didn’t include throwing them into a smoothie. Soften cream cheese, then put it in the food processor with whipped cream, confectioner’s sugar and extract. Blend until smooth then pour into a pie shell you didn’t have to make (in some cases, not having to do the work makes things even more delicious). 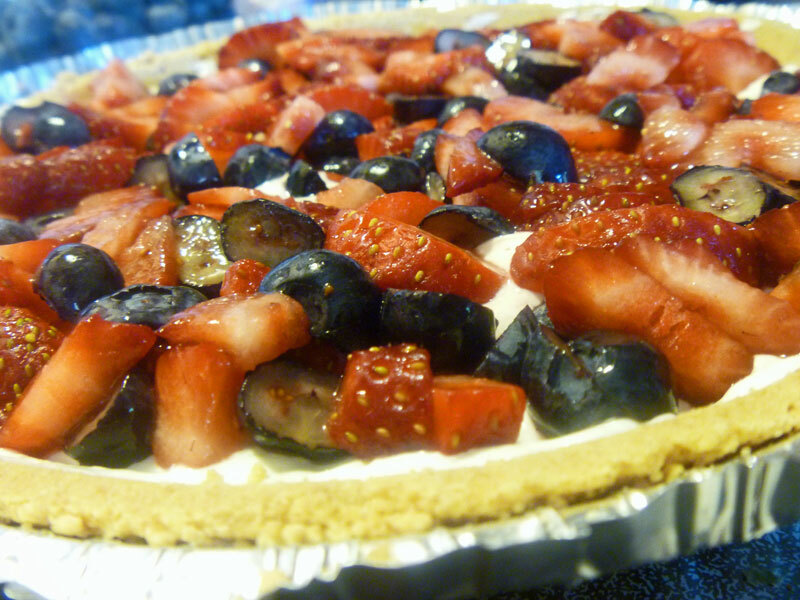 Gently massage a 1/2 tsp of white sugar into the berries you had meticulously sliced and top the pie. Let the whole shebang set in the freezer for as long as and as hard as you want your pie. Mmm. Pie. Now, this is one of those big steps for me: I do not like berries. I don’t really much care for any fruit, truth be told. This is an obvious conflict of interest between my health and tastebuds, but by and large I imagine the taste regions on my tongue are a little skewed. My sensory reactions to things began to change around 2003, and for a long time the inside of my mouth (tongue included) was numb. What do these two things mean? 1. Sometimes a delicious meal set before me tastes entirely like dish soap. This won’t happen often, and it certainly wouldn’t deign to be a predictable occurrence. 2. So in the same vein of being able to set my hands in frying pans because I had no functioning pain receptors, once I downed an entire bottle of habanero syrup as a party trick. Because I am a vainglorious idiot. I didn’t feel it, but I did wake the next morning with acid burns that had removed part of the top layer of my tongue. Again, I couldn’t feel any of it; I just don’t really show off that particular muscle in public, which is a perfectly fine outcome by our culture. What, you ask, do these things have to do with my ever-increasing distaste of fruit? I’m not a doctor (in case you weren’t certain) but I’m guessing the front and middle of my tongue is a little more out of the game than the “sour” receptors. Sour things curdle my face the way a shot of whiskey hurts a teenager’s disposition. I do not like them, condone them or want to see them in my home. And berries are sour as hell. Unless overly sugared or thrown in a smoothie, I want no part of most fruits. Don’t worry, dear readers — I love vegetables enough to cover the fruit thing. And there’s a box of powdered sugar ever at the ready in my cupboards. And despite the whole “fruit” issue, this still earned 4 spoons.